About the Book: Every so often a love story captures our hearts and it becomes more than a just a tale. It becomes an experience to remember forever. This is one such timeless love thread. Gauri is a child with many privileges- A daughter of wealthy merchant dating back many generations. Shankar, on the other hand, comes from a laborer’s family who toiled hard in life along with his mother to manage their daily expenses. One day after a hard day’s work, while Shankar was reading under a lamppost in the street, a sudden thought crossed his mind. He pricked his finger and wrote a letter with blood that was oozing out of his finger. 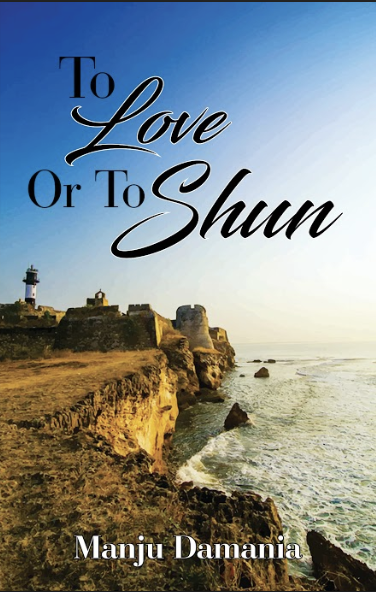 He wrote ‘To love or to shun’. He then enclosed it in an envelope and decided to mail it to Gauri. It was up to her whether she accepts or declines his love… amidst all the ordeals of family pressures and the war that broke out between the Portuguese and India. About the Author: Mrs.Manju Damania was born on 25th January, 1950. 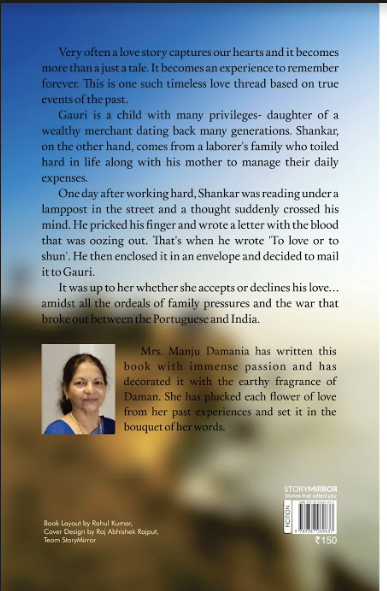 She has written this book with immense passion and have decorated it with the earthy fragrance of Daman. She has plucked each flower of love and set it in the bouquet of her imagination.